This Is Fully Funded International Scholarships In China, As the University Of Macau – China calls for applications for it Fully-Funded scholarship program which is provided to International students who wants to pursue a degree program at the Institution. This scholarship program provides each awardee of the Scholarship with a monthly stipend of MOP20,000 and a conference and research related travel allowance of MOP10,000 per academic year for a period up to four years. The Tuition and/or any other kinds of fees that may incur during the course of studies of the awardee will not be covered by the Scholarship. 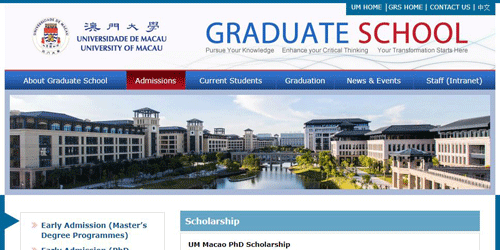 0 responses on "APPLY FOR FULLY FUNDED INTERNATIONAL SCHOLARSHIPS, UNIVERSITY OF MACAU CHINA 2018"